Inhibitory control—the ability to ignore salient but unhelpful stimuli and responses—seems to be important for learning mathematics. For instance there is now robust evidence that performance on classic measures of inhibition, such as the Stroop Task, correlate with school-level mathematics achievement. 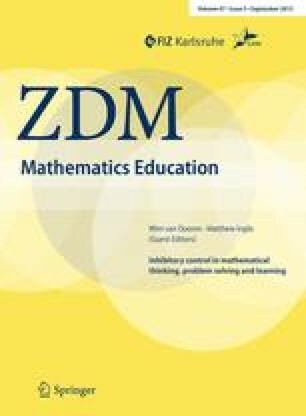 At the same time, a great deal of theoretical work in mathematics education research seems to reference the notion of inhibitory control, albeit not always explicitly. Our goal in this survey paper is to review the notion of inhibition from three perspectives. First we review evidence for the importance of inhibitory control in general cognition. Second, we discuss the relationship between inhibition skills and mathematics performance. Finally, we discuss how inhibitory control fits into a number of well established theoretical frameworks used in the mathematics education literature.